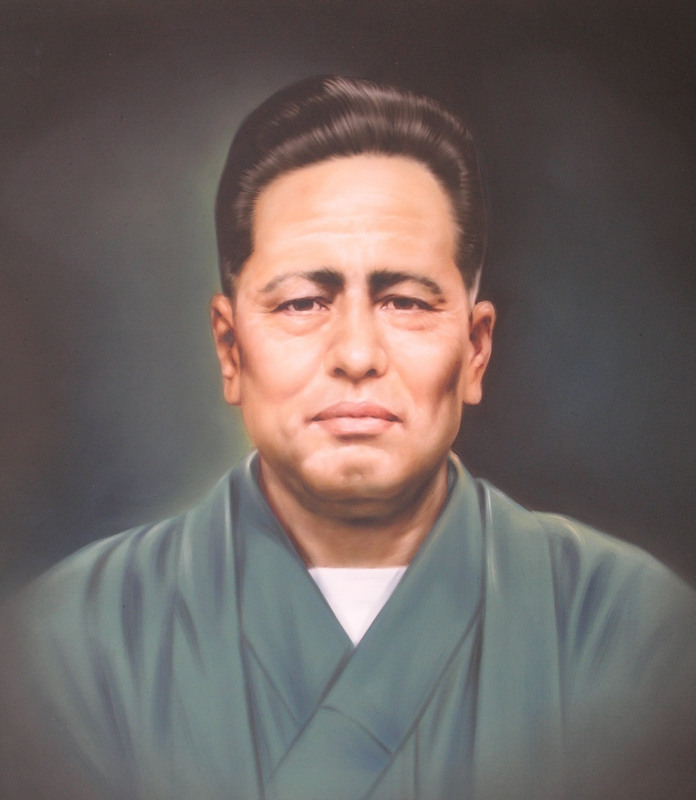 The actual founder of Goju-Ryu Karate was Chojun Miyagi Sensei（1888-1953). Chojun Miyagi Sensei was born on the 25th of April 1888, in Naha, Okinawa. His father, Choyo Miyagi was the third son of the Miyagi family. The Miyagi family had belonged to the upper Shizoku class (Ryukyu nobility) before this class system was abolished, and had served as the supplier of medical herbs to the Ryukyu royal household. After the class system was abolished in 1879, they were still a wealthy family and they were regarded as a Sohouka （素封家，そほうか meaning a wealthy family with a very large fortune, usually a capitalist or big landowner.). Chojun Miyagi Sensei lost his father, Choyo Miyagi, when he was an infant, and he was subsequently adopted by a relative who was sohouka. His adoptive father was childless and he named Chojun Miyagi Sensei as his designated heir when Chojun Sensei was still a minor. When Chojun Miyagi Sensei was 11 years old he began rudimentary karate training with the Tomari-te master and famed fighter Ryoko Aragaki Sensei (1875-1961) who happened to be his neighbour. Ryoko Aragaki Sensei was the grandfather of Shuichi Aragaki Sensei，who attained a 10th Dan Hanshi title within the IOGKF a century later. Ryoko Aragaki Sensei was also one of the few karate masters to have won in an open fight with Choki Motobu, the famous Okinawan karate fighter. In his recollections Ryoko Aragaki Sensei remembered Chojun Miyagi Sensei as an out-going and rather mischievous child with a reputation for getting into trouble, who, nonetheless was a very serious and promising karate student. Because Ryoko Aragaki Sensei recognised Chojun Sensei’s potential he decided to recommend him to learn karate under the legendary Naha-te Grandmaster Kanryo Higaonna Sensei when Miyagi Sensei was 14 years old. Under Kanryo Sensei’s tutelage, not only was Chojun Miyagi Sensei’s karate potential fully realized, his personality also became very serious and reserved. When he was completing his academic education, Chojun Miyagi Sensei jogged more than 10 kilometers daily after school to get to Kanryo Sensei’s house for karate training, and he would train his strength using rocks along the way as weights or he would strike them to toughen his fists. According to his contemporaries, Chojun Sensei was an excellent gymnast and excelled in the parallel bar exercise. Chojun Sensei also joined the school Judo team, but he was soon asked to resign because of his heavy-handedness during training. Chojun Miyagai Sensei participated in local wrestling matches but as he was often heavy-handed and because he often used Naha-te techniques, the other wrestlers were wary of him. He finally stopped wrestling when his adoptive father asked him to cease training in wrestling in order to avoid the hostility of the wrestlers. After he completed his education, Chojun Miyagi Sensei worked in a bank for a year. As they had the wealth to support his passion for karate, his family elders told him to forgo his banking job in order to concentrate his efforts on karate. Chojun Miyagi Sensei was married around 1908 and by 1910 he was drafted into the Imperial Japanese Army and assigned to basic military training in Kyushu. Prior to Chojun Sensei’s departure, Kanryo Sensei imparted to him a Bo Kata and nukite striking methods to be used in case he had to defend himself during his military service. Although in those days Okinawans generally faced discrimination in Japanese society，due to his skill in unarmed combat, Chojun Sensei was made the unarmed combat instructor of his unit. A year later, Chojun Sensei was promoted to the rank of corporal and he asked to be transferred to the medical corp, where he learnt much scientific knowledge about the human anatomy. This proved to be useful knowledge which helped him to design certain exercises in the future. In that year, he also went to a Judokan to train in his spare time. Chojun Miyagi Sensei completed his military training in 1912 and he duly returned to Okinawa to resume his training under Kanryo Higaonna Sensei. Back in Okinawa, Chojun Sensei’s reputation as a capable karateka began to spread and he faced a steady stream of challengers. In one instance, Chojun Miyagi Sensei was invited to view a cockfight with Choki Motobu. Without forewarning Choki Motobu launched an assault at Chojun Sensei, Chojun Sensei intercepted his attack and deftly floored Choki-Motobu with a counter-technique. This incident was witnessed by a local newspaperman and it became widely known in local circles. Chojun Miyagi Sensei was about 26 years old at this time (circa. 1913~1914）. Chojun Miyagi Sensei travelled to Fuzhou in 1915 in search of Kanryo Sensei’s teacher Ryu Ryuko. In Fuzhou, his entourage, including Eisho Nakamoto, found that most of the other branches of Ryu RyuKo’s style had left Fuzhou in the wake of social unrest and war, and only a few people of the older generation were left behind. One of Ryu Ryuko’s disciples led Chojun Sensei’s entourage to Ryu Ryuko’s grave to pay his respects, a formality in Chinese martial art traditions of the day, an affirmation that Chojun Sensei was a member of their school or style . Chojun Miyagi Sensei also visited the abandoned site of Ryu Ryuko’s dojo where Kanryo Sensei once trained with his entourage. Chojun Miyagi Sensei returned to Okinawa in 1915, just prior Kanryo Sensei’s death in October of that same year. Chojun Miyagi Sensei had trained under Kanryo Higaonna Sensei for about 13 years, and became Kanryo Higaonna Sensei’s longest-standing and on-going disciple upon Kanryo Sensei’s death in Oct 1915. Kanryo Higaonna Sensei was able to formally name Chojun Miyagi Sensei the successor to his style of Naha-te prior to his death. Hence Chojun Miyagi Sensei inherited Kanryo Sensei’s Naha-te system in late 1915. In 1916 in Okinawa, Chojun Miyagi Sensei formally received visiting representatives from martial arts schools in Fuzhou, himself acting in the capacity of the new head of Kanryo Sensei’s style of Naha-te. In 1916, Chojun Sensei made a second journey to Fuzhou to further his research into martial arts. In this second journey he was accompanied by Gokenki (Wu Xian Gui, a White Crane Style martial artist as well as tea merchant）who acted as his interpreter. It was in this second journey that he began to study the kata Rokkishu (六机手, a kata which later was renamed Tensho) and the Chinese martial arts manual Bubishi. He also began to design a set of training exercises called the Junbi Undo at around this time. Upon his return to Okinawa, Chojun Sensei began to devot his time, his energy and considerable wealth towards the preservation and promotion of karate. In 1918 Chojun Miyagi Sensei worked with Choki Motobu Sensei, Chomo Hanashiro Sensei and Kenwa Mabuni Sensei to set up the Ryukyu Tode Kenkyu Kai, one of the first organizations ever set-up to promote Tode (karate). On 6th of March 1921, the Okinawan Education Department (沖縄文部署) issued an invitation to Chojun Miyagi on short-notice to represent Naha-te in a Tode (karate) demonstration for the visiting Japanese Crown Prince (Later Emporer) Hirohito. The demonstration took place 4 days later on the 10th of March 1921 (Giichin Funakoshi Sensei also participated in this demonstration). In 1922 Chojun Sensei began to teach Tode (Karate) in the Okinawan prefecture Police school. In 1925 Chojun Sensei was invited to demonstrate Naha-te before Prince Chichibu (Yasuhito). In 1926 Chojun Miyagi Sensei once again worked with Choki Motobu Sensei, Chomo Hanashiro Sensei and Kenwa Mabuni Sensei to reform the Ryukyu Tode Kenkyu Kai into the Tode Kenkyu Kurabu, once again, this was an organisation whose purpose was to preserve and promote Tode (as karate was known at that time). It was around this time that he began to teach the Rokkishu (Tensho) Kata to his students. In 1926, Chojun Miyagi Sensei was appointed as the Tode (Karate) instructor for the first martial arts seminar in Okinawa organised by the Dai-Nippon Butoku-Kai. In 1927 the founder of Judo, Kano Jigoro (1860～1938）witnessed a demonstration by Chojun Miyagi Sensei. Greatly impressed by Chojun Miyagi Sensei’s skill and power, he decided to use his influence in the Japanese Martial Art circles to help Chojun Miyagi Sensei promote (Tode) karate in mainland Japan. Thereafter, Chojun Miyagi Sensei and his students regularly appeared in Japanese Martial Art (Budo) events to demonstrate their (Tode) karate. In October 1928, Chojun Miygai Sensei was invited to lecture on Tode (Karate) in the Kyoto Teikoku University Judo Club. In 1929, Chojun Sensei became a martial arts instructor in the Naha Commercial High School while retaining his prior appointment as the Budo instructor at the Okinawan Prefecture Police training school. In 1930 Chojun Miyagi Sensei was also appointed as the Tode (Karate) teacher of the Okinawan Prefecture Physical Education Association. On 5th May, 1930, Chojun Miyagi Sensei’s senior student, Jinan Shinzato Sensei participated in a demonstration in the Meiji Jingū (明治神宮) Budo Festival whereby he was asked about the name of his style of martial art, and as he had no answer for that question, upon returning to Okinawa he duly reported the incident to Chojun Sensei. Chojun Sensei realised that if Naha-te or Tode (Karate) was to be accepted in Japan, it needed to have a name. Chojun Sensei chose two words from the Bubishi phrase “Ho Goju Donto” and named his Naha-te as Goju-Ryu. The most significant amongst Chojun Sensei’s demonstrations were those in which Chojun Sensei demonstrated in the Dai-Nippon Butoku-Kai Budo gathering in 1930, and again in 1932 he demonstrated in the Seneinkan (済寧館) which was the Imperial Guards Dojo within the Imperial Palace in Tokyo. More importantly, after much public promotion and private lobbying, Chojun Miyagi Sensei, in a joint effort with other karate-masters such as Kenwa Mabuni, Choki-Motobu finally succeeded in persuading the Dai-Nippon-Butoku-kai to officially recognise Tode (karate)) as a legitimate budo system. The Dai-Nippon-Butoku-kai was the official governing body for martial arts in Japan before the Second World War, and this achievement by Chojun Sensei and his Okinawan contemporaries marked a new age for karate as the art could henceforth be legitimately taught in Japan. As the leader of the lobbying movement, Chojun Sensei’s Goju-Ryu became the first style to be registered with the Butoku-Kai. It was officially registered in the Dai Nippon Butoku Kai as “Goju-Ryu Tode”. In the same year of 1933, as the leading authority of Okinawan Tode (karate) of the day, Chojun Miyagi Sensei was made the head of the Okinawan Branch of the Dai-Nippon Butoku Kai. Henceforth, Chojun Miyagi Sensei became the official representative of Okinawan Tode(Karate) in the Japanese Budo establishment and worked towards the promotion of all styles of karate in Japan. After 1933, Chojun Miyagi Sensei promoted Goju-Ryu and other schools of karate largely through the Butoku-Kai. In 1934 he was made a permanent member of the Butoku-kai. In that year he wrote his now famous article on “An Introduction to the history of Ryukyu Kempo Tode” which he presented in a speech in 1936. By 1937 Chojun Miyagi Sensei became one of three karate masters to be first presented the title of “Kyoshi” of the Dai-Nippon Butoku Kai. It was the highest rank to be awarded to any karate master to date, and this move in itself represented a further advancement of karate’s status within the Japanese Budo establishment and a recognition that karate was becoming increasingly accepted and practiced in Japanese society. This was the accomplishment of the combined efforts by Chojun Miyagi Sensei, Kenwa Mabuni Sensei, Hironori Ōtsuka Sensei and Giichin Funakoshi Sensei in Japan, and many other pioneering karate masters of the time. Chojun Miyagi Sensei also went to Hawaii in 1934~1935 to promote karate to the local population there. Hawaii had a sizable population of inhabitants who were of Japanese or Okinawan descent and Chojun Sensei went to Hawaii upon the invitation of a local Japanese newspaper there (洋國時報社). In Hawaii he observed the training equipment of the local people and decided to incorporate one of their training equipment into the Goju-Ryu system. This later became known as the Kongoken. Upon his return from Hawaii in 1935 Chojun Miyagi Sensei once again went to Japan where he taught in the Ritsumeikan University (立命館大学) karate club. Club members at that time included Yamaguchi Gogen, So Nei Cho and Jitsuei Yogi. Several months later, in 1936 Chojun Miyagi Sensei once again travelled, this time to Shanghai, China, together with Aniya Seisho （安仁屋正昌, a student of Go-Kenki），with the purpose of visiting various Chinese martial art schools there, including the Shanghai Jing Wu Sport Association. In April of 1938 Chojun Miyagi Sensei accepted the position of Karate Instructor for the Okinawan Prefecture Teacher’s College. In 1940 Chojun Miyagi Sensei created the Gekisai series of kata. After the war, in 1945 Chojun Miyagi Sensei accepted the position to teach karate in the Okinawan Police Academy under the newly formed post-war government administration. In 1948, Chojun Miyagi Sensei began to accept private students in the garden dojo of his home once again. His first post-war private student was An’ichi Miyagi Sensei. By 1951 Chojun Miyagi Sensei once again accepted karate students from the general public into his garden dojo. Chojun Miyagi Sensei died on 8th of October 1953. In the process of building the Goju-Ryu system, Chojun Miyagi Sensei designed the Junbi Undo preparatory exercise system. He preserved Kanryo Higaonna Sensei’s Sanchin Kata and 8 Kaishu kata but he created another Heishu Kata, Tensho Kata , and 2 introductory kata, Gekisai Dai Ichi and Gekisai Dai Ni and added these to the system. He pioneered many Hojo Undo training methods and incorporated the Kongoken into the Goju-Ryu Hojo-Undo training syllabus. By the time of his death, Chojun Miyagi Sensei’s Goju-Ryu system had become one of the main karate styles through-out Japan and the world.Chojun Sensei’s intended successor to the Goju-Ryu system was Jinan Shinzato Sensei(1900 to 1945), who had constantly trained under Miyagi Sensei for nearly 3 decades, and he was the only disciple who was allowed to stand-in for Chojun Sensei in the later’s absence. Unfortunately, Shinzato Sensei was killed towards the end of the Second World War. As Chojun Sensei was never in one place for long enough to teach comprehensively between 1927 and 1938 when he finally returned to Okinawa, there was a gap of nearly a decade between his early students and his later students who witnessed his final design for the Goju-Ryu system. Upon his death Chojun Sensei was mainly succeeded by his post-1938 senior students, amongst them was An’ichi Miyagi Sensei, Chojun Miyagi Sensei’s last private disciple and live-in student. An’ichi Miyagi Sensei was the last Ushi-Deshi who witnessed the modifications that Chojun Sensei made to the Goju-Ryu system in the final phase of his life, and in that sense An’ichi Sensei’s knowledge and experience are crucial to our understanding of the complete Goju-Ryu system as Chojun Sensei left it in Oct, 1953.